My wife and I just returned from spending almost two weeks in Europe. 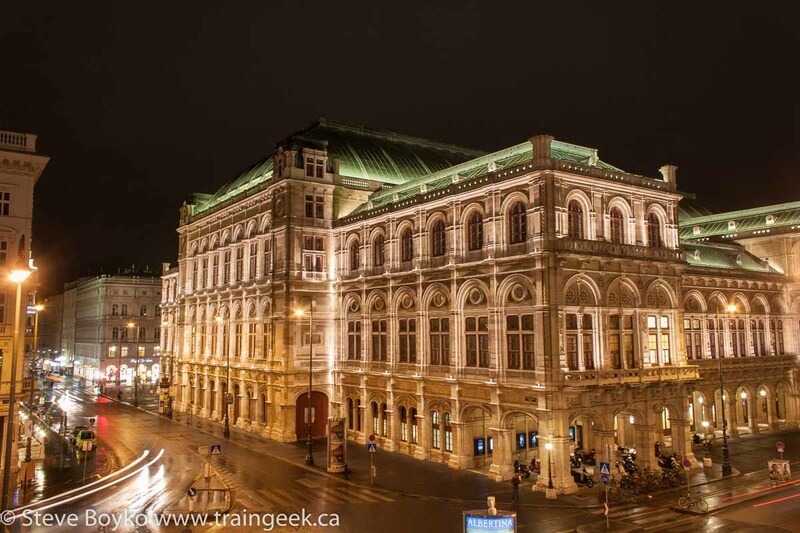 We visited Vienna first and then Prague for the remainder of our 12 days in Europe. It was a lovely time and we saw a lot of sights... and a fair number of trains too! 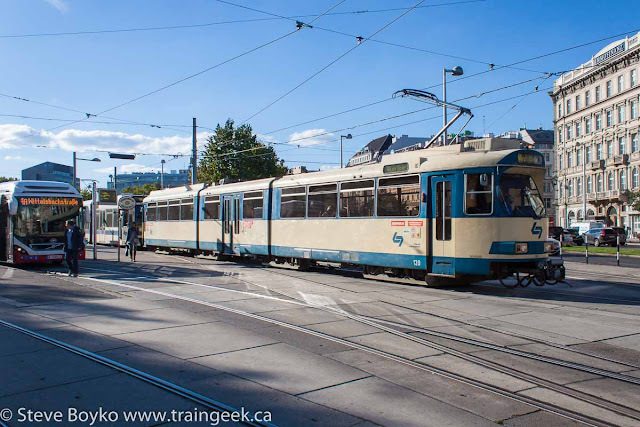 I'll write about the trains I saw on our first day in Vienna, then move on to trams and the train we took for a side trip to Salzburg. 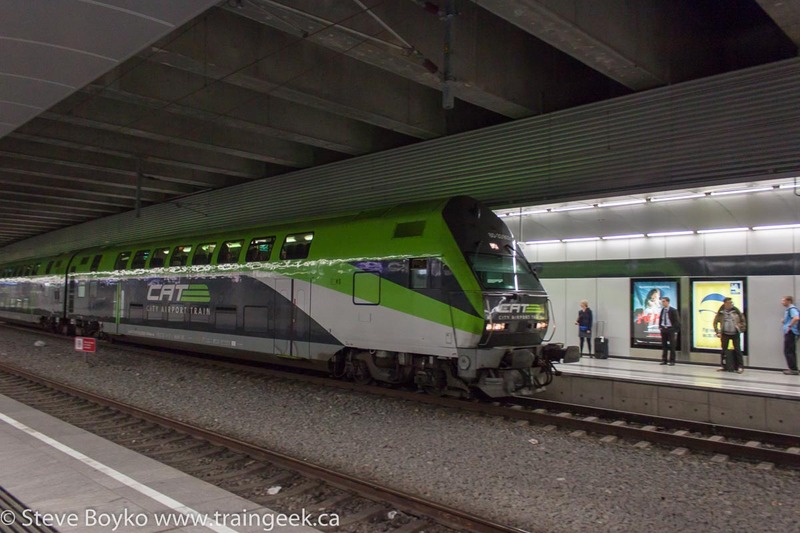 Finally I'll describe our trip on the Railjet to Prague and our Czech Republic rail experience. 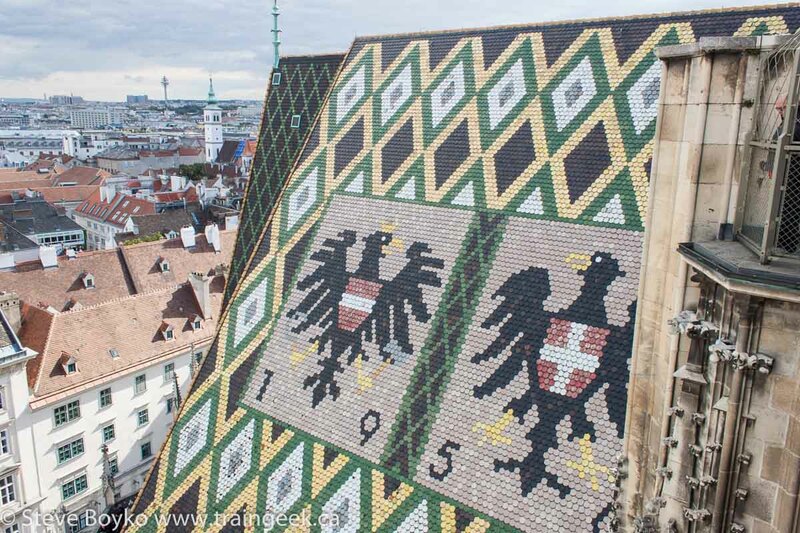 We flew to Vienna via Toronto. The Toronto-Vienna leg was aboard Austrian Airlines, and the flight was long but comfortable enough. This wasn't my first time on Austrian Airlines nor my first time in Vienna, as I spent a weekend in Vienna back in 1991. At that time I wasn't into trains so I didn't pay any attention to them, but this time I did. We love reading German words. 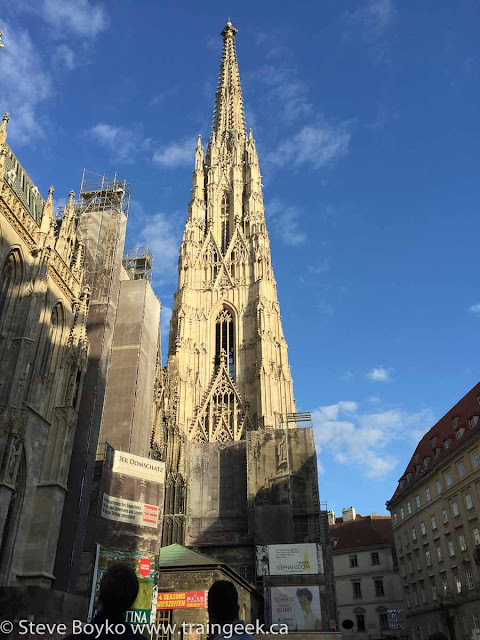 After landing in Vienna, clearing the very perfunctory customs (literally just getting our passports stamped, with no words being exchanged), and fetching our luggage, we bought our train tickets and walked down to the underground train station, the Flughafen Wien. You have two choices for trains between the Vienna airport station and the main train station near downtown, Wien Mitte ("Vienna Middle"). The CAT (City Airport Train) express train whisks you there in 16 minutes for 12 Euros, while the S7 (a local train) takes 25 minutes on the same tracks for 4.20 Euros. We took the S7. However I did photograph the CAT while waiting for the S7. 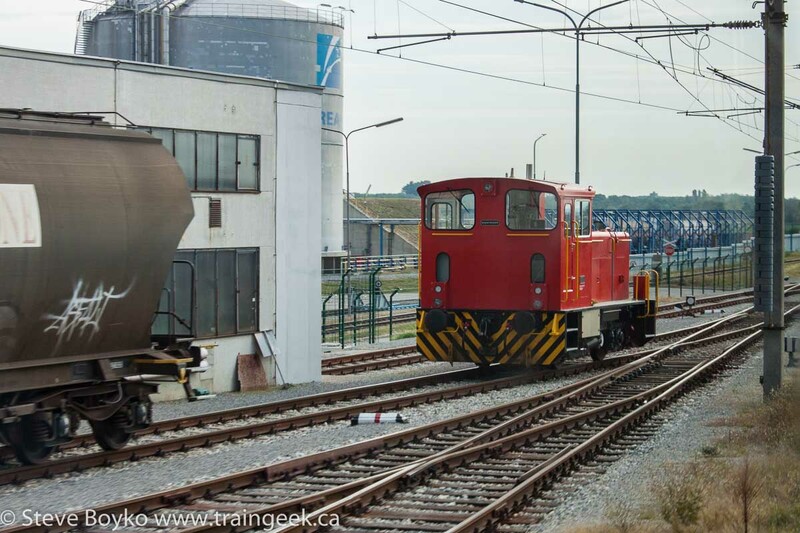 The CAT trainset consists of bilevel cars with an operator control cab at one end. It is pulled or pushed by an electric locomotive. 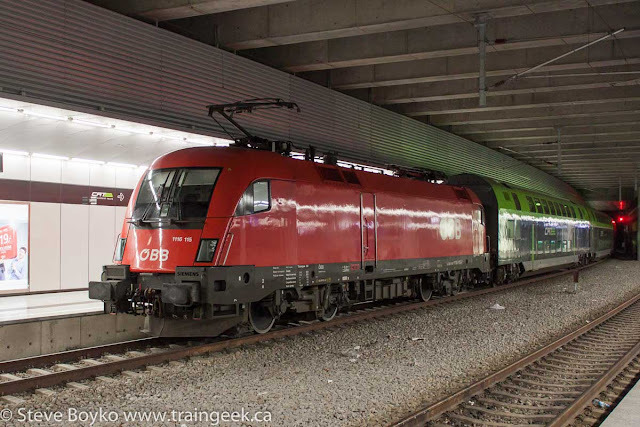 ÖBB 1116 115 is part of the Siemens EuroSprinter family of locomotives, and is an ES64U2 designed for universal operation in Austria and neighbouring countries such as Hungary, Switzerland, Slovakia and the Czech Republic. It has at least two caternaries for the different voltages on the lines it runs on. 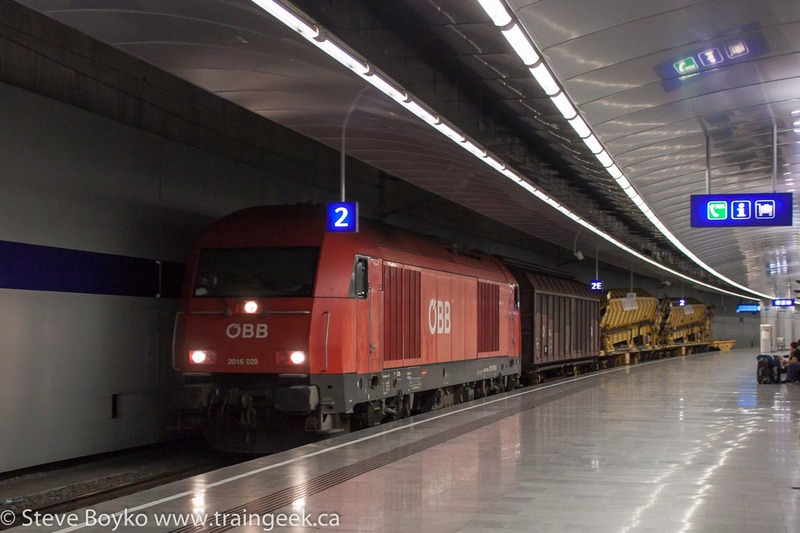 ÖBB is the Austrian Federal Railways (Österreichische Bundesbahnen) and they own and operate the rail lines in Austria, as well as freight and passenger services. The WESTbahn private company operates passenger services on some of their lines through open access. Another train zipped by while we were waiting for the S7. This was a short maintenance train that did not stop. ÖBB 2016 029 is an Austrian electric locomotive in the EuroRunner series, nicknamed "Hercules". Finally our train, the S7, came along. You can see it is an older train but it was perfectly fine for 25 minutes. As we rolled along the countryside, I was madly snapping photos out the window while my wife was no doubt rolling her eyes. 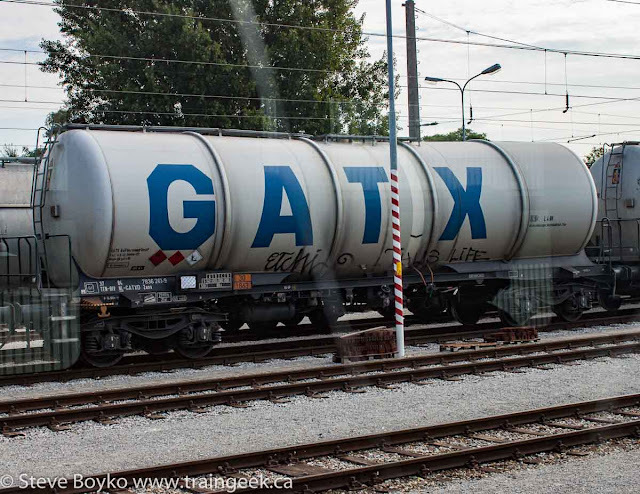 The rolling stock is so different in Europe! An industrial diesel at a local.. refinery? The tank cars are different too! Once we arrived at the Wien Mitte station, we walked to the Landstraße subway station to take line U4 to the Karlsplatz station. The Vienna subway system is known as the U-Bahn (short for Untergrundbahn or "underground railway"). They have five lines (U1 through U4, and U6; there's no U5 but it is apparently planned). Like many subways around the world, they are not entirely underground. For example, when we went to the excellent Schönbrunn palace, we took a subway and here it is at the Schönbrunn station, above ground. 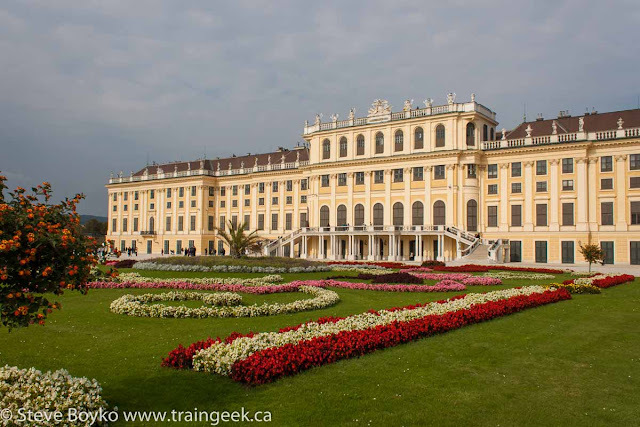 By the way, this is the Schönbrunn palace. 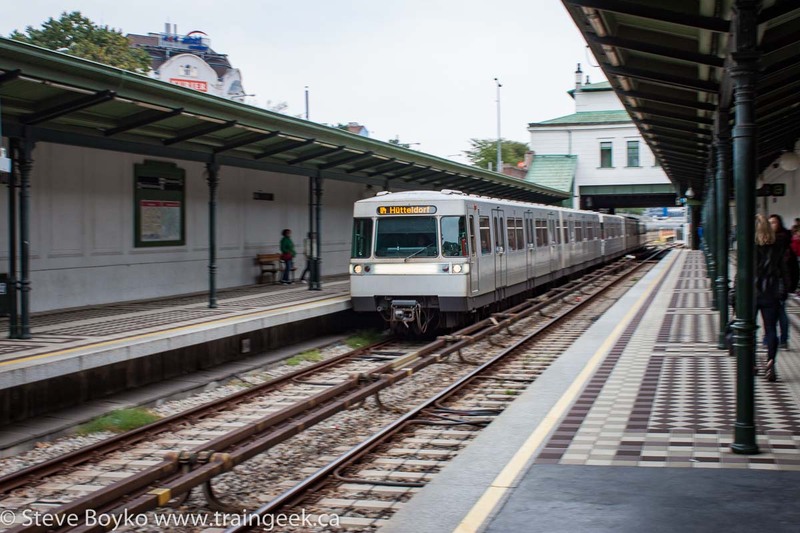 The Vienna U-bahn is very convenient and easy to use. You buy tickets at machines in the stations themselves, using cash or credit card. You can buy a single-use ticket for 2.2 Euros, which is good for travel in one direction, on any mode of transport - subway, tram or bus. You can also buy daily passes for 7.60 Euros, which we didn't use because it's cheaper to buy two one-way tickets. There's an extra cost if you leave the city (change zones) but that only happens to/from the airport for most tourists. 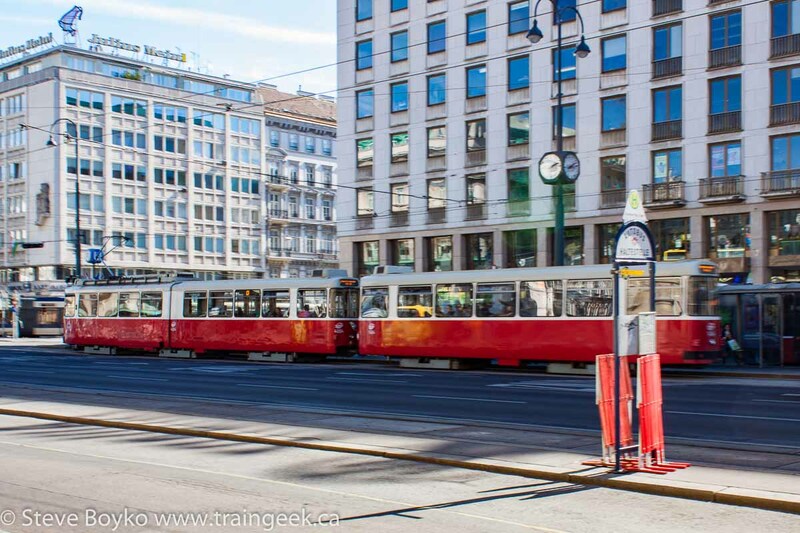 There is an extensive tram network in Vienna (the Wiener Straßenbahn-Netz), the sixth largest in the world. They have a little over 500 cars in their fleet and provide excellent service. Some of Vienna's trams date from the 1960s and 1970s. The trams run on standard gauge track and are all electrified with 600V DC overhead catenary wire. I didn't take a lot of tram photos, an oversight I corrected in Prague. Buses are well integrated into Vienna's transit system. Most of the buses are pretty modern in appearance. Some use the same electric catenary that the trams use, and some are diesel powered. 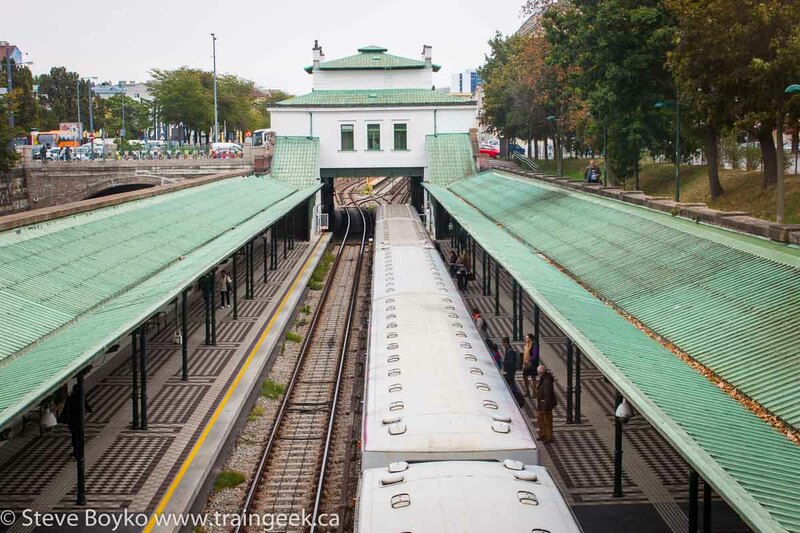 We didn't use buses very much as the subways and trams did the trick for most of what we wanted to see. Here's a few scenes from Vienna. It's such a pretty city - a lot like Paris in appearance. 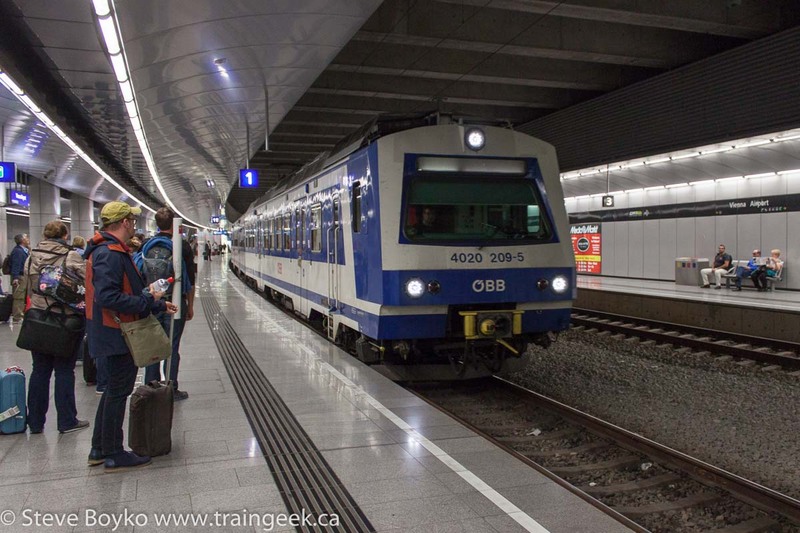 Next I'll describe our trip to Salzburg, which involved riding the excellent WESTbahn train as well as sighting a number of freight and passenger trains. Listen for the Sound of Music! Hi Steve, My wife and I just got back from 3 weeks in Europe. France, Italy, Austria and Hungary. We travelled between cities by TGV and express trains and it is a fantastic way to see the landscape. I, too, was plastered to the train window taking pictures of trains, much to my wife's embarrassment. Look forward to more posts. Hi Andrew, I hope you had a great time on your 3 weeks of travels! I've never ridden a TGV and it's on my list of things to experience. Thanks for reading and there's more to come! Were you at the Cochrane Colloquim? Hi Dave, no, in fact I had to Google that. We were just there for vacation... no work involved. Looks like your tank car may have been a jet fuel car!